May 22, 2012 – Journey to my heart…. 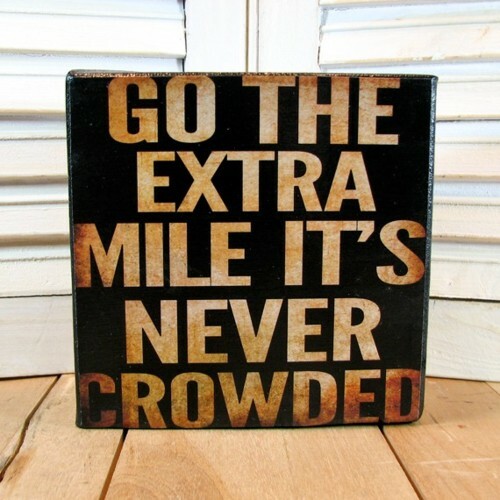 I have heard about the extra mile ever since I was a child. I can honestly say there are times I have chosen that and likely many more that I didn’t even really give thought to the extra mile. I have learned as I have matured and risked, that going the extra mile for or with someone can create unforgettable moments. I have learned that when someone goes the extra mile for me, deep gratitude bursts in my soul…. How might life be different if we all went the extra mile in some fashion? I do know that often the extra mile invites me to sacrifice something, because somehow the invitation has a way of sneaking up, often at a time that feels inconvenient…. And so, I am reminded, through this simple statement, to consider the extra mile in my day-to-day. I would love to find that it is a crowded place where I find many of my friends and family. I pray we will all find the joy in going above and beyond and delight in others who offer us the same!